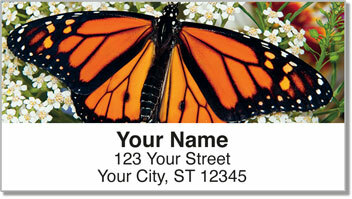 You probably recognize the orange and black winged beauties on these mailing labels as the Monarch Butterfly. But you may be surprised to learn of its connection to a certain plant. The striped Monarch caterpillar can only feed on milkweed. Experts say this is also what makes them somewhat poisonous to predators. But it goes both ways. The plant also needs the butterflies to help with pollination. Want a backyard full of butterflies. Consider letting a little milkweed grow in your garden. 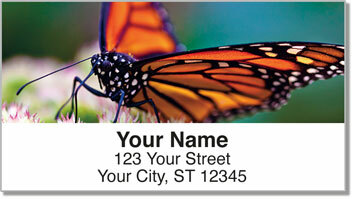 Want stunning address labels featuring the colorful beauty of nature? Choose this original design! Not only is it eye-catching, it will also save you time. 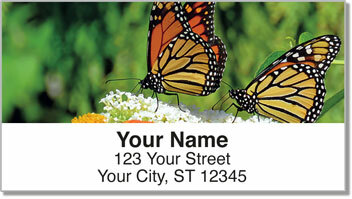 With the handy, self-adhesive backing - all you have to do is peel and place a lable on each envelope. 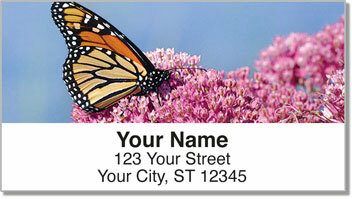 Make Milkweed Butterfly Address Labels yours today! Get them with a set of matching personal checks.